When Marten Winckelstroop and Rejmus Fiste were still pupils at Ooesterby Junior School, they formed The Left-Handed League. Several decades later, an old boarding house burns down to the ground. Somehow, the two storylines are connected, but there is no-one left alive to tell the tale. Almost no-one, that is. Fiifteen years have passed since the last instalment of the Van Veeteren series was published, and six years since you could last read about Inspector Gunnar Barbarotti. In THE LEFT-HANDED LEAGUE the two men meet for the first (and only?) 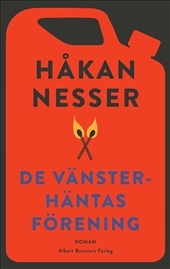 time to solve yet another difficult case, written by the master of Swedish literary crime fiction, Håkan Nesser. The Van Veeteren series consists of 10 instalments centering on the beloved character Van Veeteren. Published between 1993 and 2003, the series has sold over 4 million copies in Germany alone, and more than 10 million worldwide. The Barbarotti series follows Detective Inspector Gunnar Barbarotti, and consists of five instalments published between 2006 and 2012. The series has sold over 2 million copies in Sweden alone. Combined, the series has been published in 28 countries and have delighted tens of millions of readers everywhere.